The United States has fallen behind Chinese ground-based missile development due to a decades-old arms control treaty with Russia, threatening America's edge in future wars against Beijing, the top U.S. military commander in the Pacific warned Thursday. 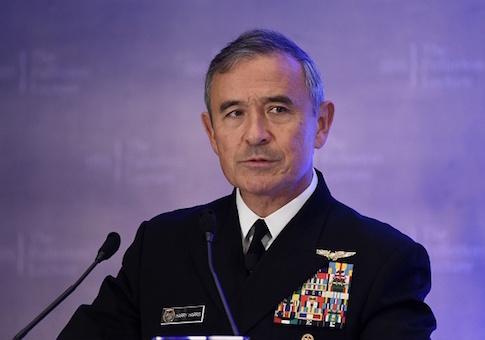 "We are at a disadvantage with regard to China today in the sense that China has ground-based ballistic missiles that threaten our basing in the western Pacific and our ships," Pacific Command chief Adm. Harry Harris told the Senate Armed Services Committee. "We have no ground-based capability that can threaten China because of, among other things, our rigid adherence, and rightfully so, to the treaty that we sign onto, the INF treaty," he said, using the acronym for the Intermediate-range Nuclear Forces Treaty. Harris, who has been nominated to serve as the American ambassador to Australia, said the 1987 INF agreement between Washington and Moscow banning certain land-based intermediate-range missiles puts the U.S. military "at a disadvantage in the western Pacific" because China is not bound by its provisions. In testimony before the House Armed Services Committee last month, he said over 90 percent of Beijing's ground-based missiles would violate the INF treaty. Both China and Russia have outpaced the United States in their development of maneuverable hypersonic ballistic missiles that could be capable of penetrating enemy defenses. The Pentagon's 2019 budget proposal calls for greater investment in research for programs to defend against Russian and Chinese pursuit of hypersonic weapons. The Russian military said on Monday it had successfully tested a nuclear-capable hypersonic missile that could bypass U.S. missile defenses. "Russia is not supposed to have those, but we now know that Russia does because they've been cheating on [the INF] treaty," Sen. Tom Cotton (R., Ark.) said Thursday, before pressing Harris on U.S. adherence to the agreement. "If this country were no longer part of the INF treaty and we could produce ground-launched, intermediate-range cruise missiles, could you explain what that would do to the military balance of power in the PACOM area of operations?" Harris stopped short of calling for Washington to pullout of the agreement, but said the Trump administration needs to "consider ways to work within the INF regime to overcome these shortfalls" presented by China. "We could do anything from one extreme—to pull out—to the other extreme—to do nothing—and I think we should look at ways to maximize our operational flexibility with regards to the advantage that China has over us in terms of ground-based ballistic missiles," he said. Harris oversees about 375,000 military and civilian personnel and operates in a region that spans more than 100 million square miles, or more than half of the earth's surface. His testimony before the Senate panel Thursday was likely his last as PACOM chief.